In a disused building in E17 last minute preparations are underway for this year's Temporary Automous Art Festival. Temporary Autonomous Art (TAA) is a DIY art movement, originating in the London squat scene and now a Europe-wide phenomenon. Free to attend and with no curatorial policy, TAA Festivals offer an alternative to the commercialism and elitism of the mainstream gallery system. London TAA, which kicks off today and runs until April 23, includes sculpture, spoken word, installation, painting, cabaret, photography, live art, workshops and music. Artist Katy Baird, who is performing at TAA on Thursday, had this to say: "I love that it’s ephemeral because it gives it an urgency that you wouldn’t have in a normal gallery. There’s something beautiful about the fact that it’s all just going to get taken down. Everyone’s aware that it’s just there for that short amount of time and it’s never going to get replicated – each year is completely different." 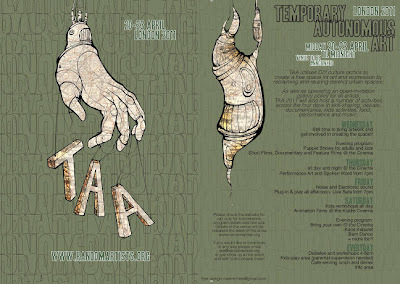 London TAA: Midday till midnight 20 - 23 April, opposite 58 Blackhorse Lane, E17.